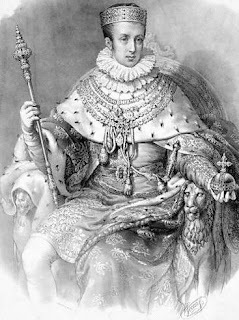 Although he may not have been what the world would consider a “successful” monarch, I have always had a soft spot for the Austrian Emperor Ferdinand I. He was, undoubtedly, handicapped but probably not so disabled as most people think and he was a very kind man, a devoutly religious man and a monarch who did the best he could for as long as he could. He was born on April 19, 1793, the first son of the Holy Roman Emperor Francis II and his consort Maria Theresa of Naples and Sicily. Unfortunately, because the two were so closely related (being double first cousins), Ferdinand was born with some severe disabilities. The Emperor was overjoyed with the birth of his little boy, looking with his heart rather than his head, and hurriedly announced the arrival of a “healthy” baby which was certainly not the case. Medical staff had to work hard to keep him alive and it was evident from his unusually large head that he had severe problems. Among his ailments were water on the brain, soft bones and severe epilepsy, causing him to have as many as twenty seizures a day. There were also other neurological problems that became evident as he grew older. He was, for example, very slow in learning to talk and when he did, suffered from a considerable speech impediment. His health was always fragile and, unlike most Hapsburg heirs, his formative years were spent only with feminine attendants, being six years old before he was given a male tutor. Because of his disabilities, learning was difficult but not impossible, though it often seemed his education was not appropriate to his position. Still, he enjoyed studying heraldry and was fascinated with new technologies and farming. His mother had always kept him rather hidden from public view but things changed following her death (when Ferdinand was only 14) when he was given a new stepmother in the person of Maria Ludovika of Modena. She dismissed his old tutors, considering their regimen unhealthy, and appointed a new staff that would push him toward a more “normal” life. He became more independent, was taught how to read and write, how to ride a horse, to dance, fence and was even given piano lessons. He enjoyed drawing and the Empress encouraged this but after a problem with his tutor, his education was declared sufficient and he was moved on to study military theory, science and the like. Despite being handicapped, he kept a regular diary and was capable of making good sense, even becoming known for his sharp eye and witty remarks. 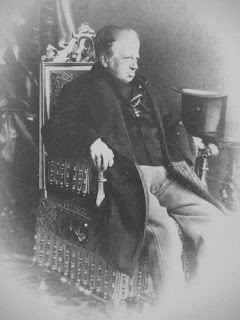 By the time he was 36-years old in 1829 he was sitting in on State Council meetings to prepare him for his future role as emperor. 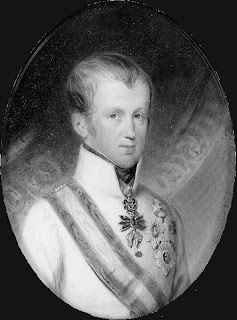 The following year, in 1830, at the insistence of his father, the heir was formally crowned King Ferdinand V of Hungary on September 28 in Pressburg (modern-day Bratislava). The Hungarian elite presented him with a gift of 50,000 ducats which he donated to the poor of Hungary. As this marked Ferdinand coming more into his own, it was necessary for him to marry and, as usual for the time, the Imperial Family and government took up the matter with Ferdinand having little say. The choice they agreed on was Princess Maria Anna of Savoy, daughter of King Victor Emanuel I. Obviously, the disabled crown prince was not the sort of man a young girl dreams of marrying and the Italian princess reportedly burst into tears when told of her fate. However, with the selfless dedication of so many daughters of her house, she carried on and did her duty. The two were married and, happily, became a touchingly devoted couple. Despite his repeated best efforts, Ferdinand’s seizures made it impossible for him to ever consummate their marriage but he loved his wife and she took great care of her rather infirm husband throughout his life with never a word of complaint. She looked beyond his disabilities to see the sweet natured, good man underneath. 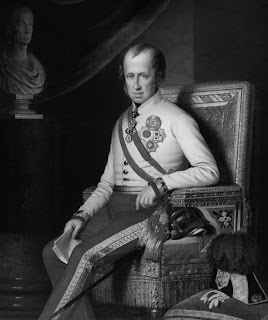 Of course, not everyone displayed such a Christian attitude and not long after the crown prince narrowly survived an assassination attempt in 1832, an occupational hazard the House of Hapsburg was all too familiar with. The good nature of Ferdinand was displayed again at his wedding when he donated his wedding gifts to build a new waterworks for the city of Vienna. On March 2, 1835 Emperor Francis passed away and his son succeeded him as Emperor Ferdinand I of Austria, as well as, of course, King of Hungary and Croatia, King of Bohemia and King of Lombardy-Venetia among his long list of titles. Emperor Ferdinand was, in fact, the last to be crowned King of Bohemia and the last to be crowned with the sacred Iron Crown of Lombardy (he would be crowned King of Lombardy-Venetia in 1838 and crowned King of Bohemia with the Crown of St Wenceslas in 1836). Obviously, because of his disabilities, public appearances could be problematic and the new Emperor needed a great deal of assistance in governing the Austrian Empire. Because of that, the effective running of the multi-nation state was left to a three-man regency council led by the veteran statesman Prince Metternich. However, it must be remembered (though all too often it is not) that Emperor Ferdinand was never declared to be incapacitated, he was able to perform many physical activities from riding to fencing to shooting, was conversant in five languages and could play two musical instruments. The idea that he was some sort of mental vegetable is completely untrue and unfounded. Emperor Ferdinand was not helpless nor an imbecile as he is so often portrayed. In fact, he should be credited for having the intelligence to know his own limitations and those limitations were reached with the outbreak of the Revolutions of 1848. In seemed to take no time at all for nearly the whole of Europe to be thrown into rebellion and turmoil. It was a monumental crisis and Emperor Ferdinand realized as much as anyone that he was simply not up to the job. 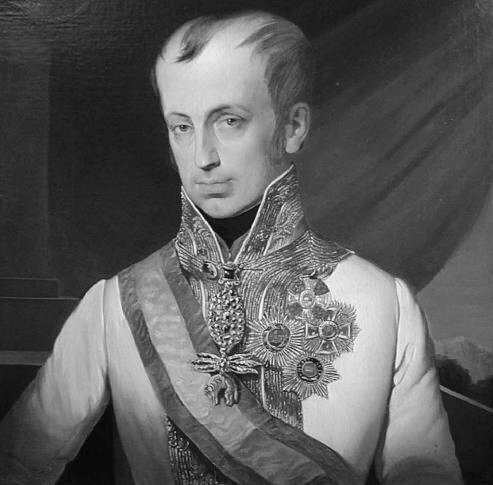 Even the formidable Prince Metternich fled the country as riots broke out in Vienna. When viewing the mob from a palace window, the benign and somewhat perplexed Emperor turned to an attendant to ask, “But, are they allowed to do that?” The Imperial court was forced to leave Vienna for the safety of Innsbruck and there began to plan the counter-revolution to take back the capital and restore order to the empire. To command this campaign, a younger, healthy monarch was needed and Archduchess Sophie, a formidable woman without question, was quick to point to her son Francis Joseph (her husband being both less capable and less willing to assume the throne). Emperor Ferdinand could easily see that this was the best course of action, he had the advice of the able statesman Prince Felix von Schwarzenberg, and abdicated in favor of his nephew, handing power over to him and pledging his own allegiance. When the 18-year old new monarch thanked his former emperor, Ferdinand replied, “Don’t mention it, Franzl, it was a real pleasure”. During his reign (especially in Bohemia) he had been known as “Ferdinand the Good” but after his abdication the wittier members of the rebellious mob dubbed him “Goodinand the Finished”. No doubt they were less glib after a taste of the determination of the new monarch and the fire of marshals Radetzky and Windisch-Graetz. For his part, Emperor Ferdinand, who referred to his change in status as a ‘transfer of government’ rather than an abdication, retired with his beloved wife to Prague Castle. He and his wife devoted much time to the Church, both being devoutly religious people, and (to the surprise of the misinformed) he actually showed himself to be a quite competent businessman, dealing in local Bohemian goods, increasing the trade and profits of the region, in the process amassing a considerable fortune for himself which made up much of the wealth of Emperor Francis Joseph following the death of his uncle. Emperor Ferdinand I died in Prague on June 29, 1875 at the age of 82 and was buried in the Imperial Crypt in Vienna with his predecessors. It is unfortunate that all too often Emperor Ferdinand I is remembered only for odd sayings and portrayed as someone who barely comprehended the world around him. He is the sort, rare though such cases are, upheld by revolutionaries as an example of the “danger” of monarchy and hereditary authority. The truth, of course, is that Emperor Ferdinand, while certainly disabled (through no fault of his own) was much more capable than he is usually given credit for. He was a good man, a devoted husband and a faithful and pious son of the Church. Slightly slow, perhaps, but still more intelligent than a great many perfectly healthy people and he was a man who knew his own limitations. His abdication (or “transfer of government”) was based on his sense of duty to the Austrian Empire and that sense of duty had guided his life. Despite his limitations, he worked hard to do the best job he could for his countries and all his peoples. Far from being an example of the “danger” of monarchy, the case of Emperor Ferdinand shows that just because a monarch is handicapped, things do not fall apart. The outbreak of revolution in Austria cannot be attributed to his disabilities as such unrest broke out in France and Germany with perfectly healthy rulers. When it was realized that he was not up to the challenge, Ferdinand I accepted that the best thing for his house and his empire was to step down in favor of another. It was all handled “in house”, quickly, smoothly and to the benefit of all. That is how Emperor Ferdinand should be remembered; as a good, faithful man and monarch who persisted in spite of adversity to do the best for his empire.